Kathleen Adams' life is journal keeping and this book reflects the passion she has for using writing to enrich our lives. 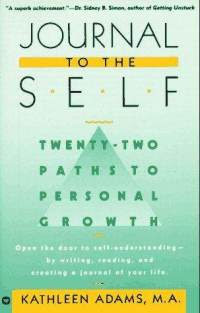 Whether this is your first venture into journaling or you are a veteran journaler, you will find fresh ideas and satisfying reading in "Journal to the Self". The book is full of journaling prompts and techniques that will have you feeling as though the author is holding your hand. Kathleen is the Director of the Center for Journal Therapy in Colorado, and the author of several journaling texts, including a workbook that accompanies this book.